More U.S. women are having twins these days. The reason? Older moms and fertility treatments. One in every 30 babies born in the U.S. is a twin — an astounding increase over the last three decades, according to a government report issued Wednesday. 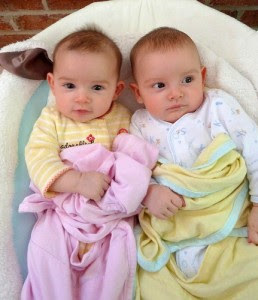 In 1980, only 1 in every 53 babies was a twin. When people say it seems like you see more twins nowadays, they are right, said Joyce Martin, an epidemiologist who co-authored the Centers for Disease Control and Prevention report. About 7 percent of all births for women 40 and older were twins, compared to 5 percent of women in their late 30s and 2 percent of women age 24 or younger.